Microsoft’s Build developer conference is getting under way in San Francisco. Gartner’s Hype Cycle for new technologies runs from the Peak of Inflated Expectations through the Trough of Disillusionment, eventually settling at the Plateau of Productivity. Inflated expectations for Windows 8 – the iPad killer – expired many months back and we are well down in the trough, with little momentum behind the Windows 8 tablet platform, OEM partners still searching for the right way to package Windows 8 and coming up with unsatisfactory and expensive hybrid creations, and iPad and Android tablets ascendant. At this point, Microsoft needs to win over its core market, much of which is determined to stick with Windows 7, as well as injecting some life into the tablet side of Windows 8. The platform has promise, but it is fair to say that the launch has been difficult. The advantage now is that Microsoft is in a period of incremental improvement rather than reimagining Windows, and incremental improvements are easier to pull off. More reports soon. 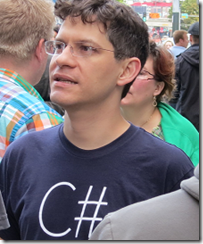 The schedule also includes news of Visual Studio 2013 and there is likely to be a new preview for this as well. A smoothly integrated development platform across Windows client, Windows Phone, and the Windows Azure cloud, with a dash of XBox One for game developers? Microsoft has all the ingredients but with questions about whether it is able to deliver, as it is currently losing the battle for the client (PC and devices). One answer for C# developers hedging their bets, or just trying to take advantage of the huge iOS and Android market, is the Xamarin toolset which lets code in C# and .NET and share non-GUI code across all the most popular platforms. Xamarin hosted a large party for Microsoft-platform developers last night in San Francisco. Xamarin’s approach is winning significant support, since it ensures a native GUI on each platform while still sharing a large proportion of your code. Mono and Xamarin founder Miguel de Icaza was there to evangelise the Xamarin tools. 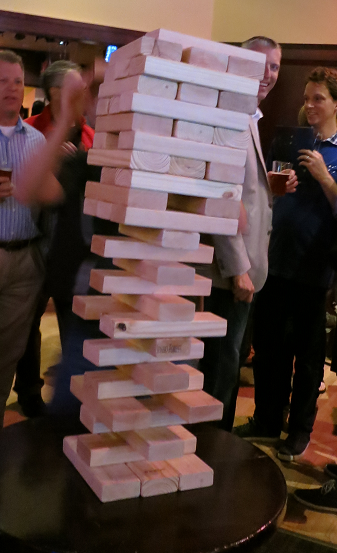 There was also a giant Jenga-like game. Here’s hoping that neither Xamarin’s nor Microsoft’s development stack looks like this.